We are ISO 9001 (quality) and 14001 (environmental) qualified, and we are compliant with all state and national OSHA, EPA, workplace safety, and product safety standards. We provide global sourcing – and we operate with reliable sources worldwide – but we can offer 100% made in the USA products. 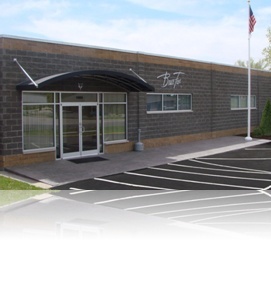 As important as any part of our operation is our Waste Water Treatment facility. This is a closed-loop system, which culminates all rinse agents from photo processing, chemical etching, and electroplating. This system was put on line nearly 20 years ago—well ahead of the “green scene”—and even today it exceeds all EPA and OSHA standards. Among our crew are three operator-technicians who monitor and manage this facility every hour during plant operations. All told, our treatment facility is a multi-million dollar investment we have undertaken as a commitment to the quality of our product and our environment. We are located in Indiana—known as America’s Crossroads—near Louisville, Kentucky. We are within three ground shipment days of over two-thirds of the U.S. population. Louisville is a logistics hub, with UPS’s overnight and international operations and many related carrier operations located here. We protect our distributors, and offer complete program protection. If you developed and sold a particular piece of business, we decline any bid to other parties. Nearly 80% of our business repeats each year. 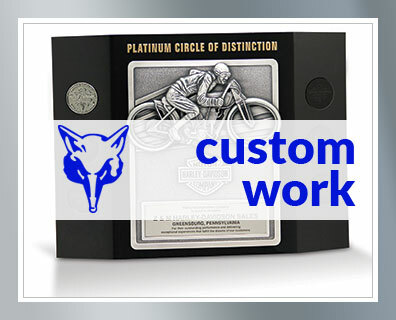 And the average longevity of a custom award design is 11 years. Much of our manufacturing operation is represented by the United Steel Workers.